I went to Seoul last year, exactly on mid April, without knowing anything about its local food except for what I used to see in Korean dramas: Bulgogi, Bibimbap, Jjajangmyeon and Tteokbokki. So when I actually came there, honestly it was like a total blast; you keep getting surprised of 'accidental food discovery', especially the things we found on the streets late at night. If you're wandering around Seoul, you just can't miss Myeongdong and Insadong. These were two distinct shopping area close enough to each other (by train) and obviously your go-to places if you're looking for Korean street-food delicacies. So let's dig in! KOREAN STREET-FOODS: Heaven on Earth. Tteokbokki, one of the most delicious snack ever! Gimbap or sushi rolls. Image taken from here. Credits to the respective owner. Tteokbokki 떡볶이. Sliced rice cakes + fish cakes drenched in Korea's most famous condiment: gochujang or red pepper paste. This is the MOST famous Korean street-food, it's as addictive as French Fries to Americans, and Cireng to West Java people :p Ranging from ₩2,000 - ₩4,000 (around IDR 20,000+) a plate, it's warm, filling, and I'm just a big fan of the gooey texture of the rice cakes! Gimbap 김밥. Rice rolls stuffed with various fillings, mostly vegetables, and wrapped in seaweed sheets with hints of sesame oil. The street style gimbap/kimbap are often pretty simple, with only picked vegetables & egg. You can also buy fusion version of gimbap with cheese, ham, salmon, tuna etc in local minimarkets. Another variation is called 'Mayak-Gimbap', which is a smaller & thinner version of rice rolls in cigarette shape. This is how Koreans like their sushi rolls! Perfect for grab-and-go. Oden 오뎅. A wintertime favorite dish; skewered fish cake boiled in clear broth of Asian radish and kelp. How to eat: dip it first in soy sauce dressing and then drink the soup on separate cup. It costs about ₩700 to ₩1,000. Sometimes it is also referred by its native name Kkochi-eomuk (꼬치 어묵). Often found on every Korean dishes, also served as appetizer/banchan. Hotteok (호떡). A ball of flour or glutinous rice dough is filled with a mixture of sugar, ground peanuts and cinnamon powder, then pressed flat on a hot griddle. It's very famous in Insadong, where people would line up especially on a freezing weather. Best served as HOT as it gets out of pan. Last time I checked it costs around ₩1,000. Hodugwaja (호두과자) or Walnut Cake. Sweet round cake made using this really cool machine that bakes the batter into walnut-shaped cast and filled with red bean paste + a small slice of walnut. A small bag of 10 costs ₩3,000, but there's also gift-box package available for ₩10,000. It tastes really good and feels healthier also, since it's baked, not fried like hotteok. Twigim (튀김) is Korean general term for fritters. Similar to Japanese Tempura, you have options of vegetables, sweet potatoes, shrimp, squid, and dumplings. You can dip it in a soy sauce dressing, or with tteokbokki sauce (gochujang). One serving costs between ₩2,000 and ₩3,000 ...a plateful! Korean French Fries + Hotdog. Image taken from here. Credits to the respective owner. Tornado Potato Wrapped Hotdog. Image from here. P.S: If you don't like your images to be published here, please do let me know in comments - no copyright infringement intended, only sharing :). 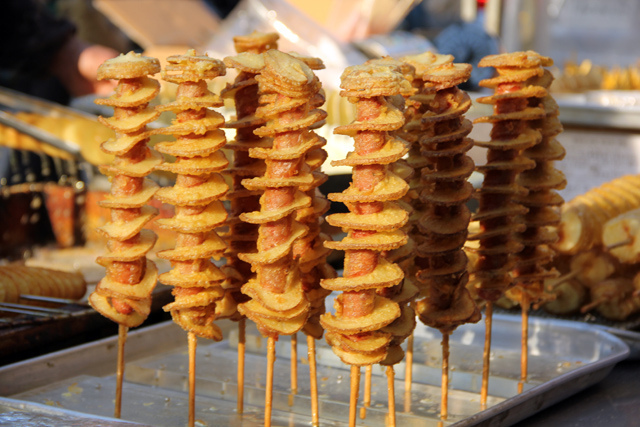 Tornado Potato: A whole potato is cut using spiral slicer to create that giant spiral 'tornado' effect, then tucked on a long stick then deep-fried until crunchy and finally sprinkled with super yummy, cheesy, garlicky MSG powder, lol. Costs around ₩2,000. Tornado Potato-wrapped Hotdog. See what I mean by Koreans' creative thinking for street-food? Yes. Myeongdong is exactly the place where you'll discover new concept of food creation, since it's visited by millions of people everyday until dawn, you can almost feel the vibe of fierce competition for street stalls. Either it attracts customer & becomes new trend, or you went bankrupt the next day. Everything sausages. Image taken from here. 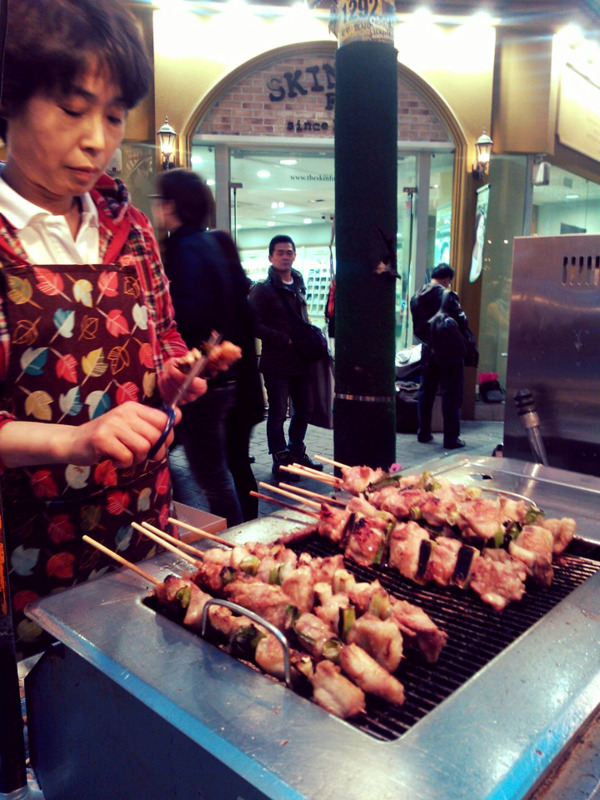 Dak-kkochi (닭꼬치), is grilled chicken on a skewer basted and drenched with Korean chili pepper glaze or soy sauce dressing. It costs around ₩1,500 - ₩2,000 a stick, and you can just smell it from afar. Too good to be missed! ...I swear, Koreans cook their chickens very well! It's my personal favorite and one of the BEST among all street carts out there. DIE DIE MUST TRY. Dried Octopus & Squid, Pressed Fish, Octopus chips, Buttered Squid Jerky, etc. Same as in Japan, Koreans are also big fan of tentacles snack. It's very popular and said to be the kind of snack that the locals eat and grow up with. The smell is quite strong, you just can't miss it if you're a big seafood fan. Costs around ₩1,000 - ₩3,000 a cup, depends. This image is taken from here. Other than what I've listed above, there are so many things left to try when you're in Seoul. From the authentic Korean snacks that I'm not willing to try such as Bundaeggi (boiled Silkworm larva served in a cup) and Soondae (pig's blood sausage), to the international fusion such as Turkish Ice Cream, Kebab, Shwarma popular in expats area Hongdae/Itaewon, and the super tall & massive Ice Cream Cone in Insadong (or everywhere). Korea offers one the best street-food option in the world, and when you pay a visit there, it's almost impossible to be missed. It's very famous for its late night street carts (called pojangmacha, or just pocha for short), which means "covered wagon". They're basically small tented restaurants on wheels which sells the majority of street-foods such as tteokbokki, eomuk, gimbap, hotteok, soondae, etc + the ultimate accompanying drinking for Koreans: SOJU. Yes, it's like what you've always seen in K-dramas!